For the last 10 years, here at GetReskilled, we have been helping people from a wide range of backgrounds make mid-career changes into well-paid jobs and careers into the pharmaceutical and medical device manufacturing industries. With a decade of experience in the industry, we’ve come to learn what works and, more importantly, the mistakes to avoid as you begin your job hunt. To find all of our job hunting advice in one handy place, head on over to our Job Hunt Resource Centre. Today we’re going to focus on sharing our “7 Deadly Sins” of pharmaceutical job applications. Thanks to technology, applying for jobs is now easier than ever. This is great for you as a job hunter – you can now apply for multiple jobs in one day, from the comfort of your own home. But there is a downside. It also means that companies now receive more applications per vacancy than ever before. As a result, to be successful in today’s job market, you really need to aim to submit 5 applications per week. We have seen job hunting as, on average, a 25-week long process. If you apply for 5 jobs in each of those weeks, you’ll drastically improve your chances of the job you really want. It sounds a lot but 5 applications a week is absolutely realistic. At least 70% of applications should be in reply to a job advert, but you can also consider speculative applications to companies you’d like to work for. It can never hurt to have a well-crafted CV in front of an employer for your dream job. And you may find that there is a position about to open or you might hear back if one becomes vacant soon after. It’s always worth trying. These applications don’t stop as soon as you land your first interview either. They keep going until you have a signed contract with a company for a great job. Until then, keep applying! Firstly, before you submit an application, you need to gather as much information as possible about the role and about the company so you can tailor your application to reflect their needs. You should be using the language used in the job advert throughout your cover letter and CV to make it obvious that your skills match their requirements. Then, as you move forward in the process, you should have a method by which you keep track of these requirements. One way to do this is to make flashcards for each role you apply for. This may sound a little extreme but if you get a call or email from a hiring manager, flashcards are great for a quick refresher to ensure your message stays consistent with their key requirements. Similarly, as you move forward through interview processes, the initial job advert is likely long gone and flashcards will take a lot of stress out of preparation. Something as small as a telephone call or email exchange with a recruiter can be enough to set yourself above the competition or rule yourself out entirely. If flashcards aren’t your thing, you need to find another system to help keep track of these applications and their requirements. We all know how important first impressions are. In the world of job hunting, that first impression is generally your CV. When people look at CVs, a judgment can be made on first glance before the details are even read. Mistakes or errors are too easily attributed to apathy, laziness or ignorance – don’t let that be the first impression you make. So what are the common mistakes people make on their CV? Too many personal details – only include your name, address, email address, telephone number and LinkedIn link details. Make sure you have a professional looking email address! Lies – just don’t do it. The good news is that we have several CV templates for you to download and fill out. Using these will help you avoid many of the common errors people make. Check them out here. This is probably one of the most common mistakes. It may seem like an easy option but trust us when we say that using a standard application is obvious and it doesn’t impress anyone. Regardless of how many applications you’re making, every hiring manager should read your application and feel like their vacancy is the only job you’re interested in. While the key information on your CV will be the same, the way you highlight relevant experience will change depending on the role. The summary section should also be heavily adapted each time you apply for a job. Within your 2-5 line summary, make sure your first line outlines why you are qualified for the role – it should be an attention grabber. Then you need to take the specific language of the job advert, picking out their keywords and phrases describing roles, duties, and responsibilities. Use these specific words in your summary to spell out how suitable you are. It may seem a little excessive but some companies actually do a keyword search on CVs, you want to make sure you’re phrasing your skills and experience in the way they’re asking about them. If you can show you match all those key points early in your CV, you’ll have their attention and increase your chances of seeming like their “dream candidate”. You’ve done all the basic checks, spent a long time putting together your content and formatting it so it looks impeccable. Chances are, by now, you’ve looked at it too often and you’re too close to see any gaps or mistakes. Firstly, print a copy of your CV, take a short break and then proofread from your paper copy. Then get a family member or friend to read it for a basic error check. From there, find at least 3 other people to review and critique it. These people should ideally be in the pharma or med device industries (or a related field) so they can offer advice about key information to include. Ask for as detailed a set of feedback as possible from them. The key questions are, if they didn’t know you and saw this CV, would they hire you? To take that a little further, what was the exact thing that convinced them or put them off? All feedback is useful in your job hunt. Learn to ask for it, and learn to learn from it. As we discussed, there are a huge number of jobs, but also a large pool of candidates. You have to find ways to set yourself apart. One way to do this is following up on your application, and you should see this as part of your application process. For each application, send out a follow-up email to the recruiter at around 8 am the following Monday morning. This means your email will be one of the first emails they see as they start their week. All you need to say is that you’re confirming that they received your application, you’ve attached your CV just in case and that you look forward to chatting with them soon. This isn’t cheeky, pushy or annoying; this is assertive and proactive. The truth is that you’ll likely just not hear back from applications that are unsuccessful but you can follow up like this two or three times over two to three weeks before you admit defeat on an application. Even more important than following up your applications, is following up on interviews. Send a follow-up email to your interviewer before the close of business on the day of the interview. Highlight one area that you’re particularly excited by – a specific duty, the company 5-year plan, anything really. Tell them you’re looking forward to hearing from them soon. 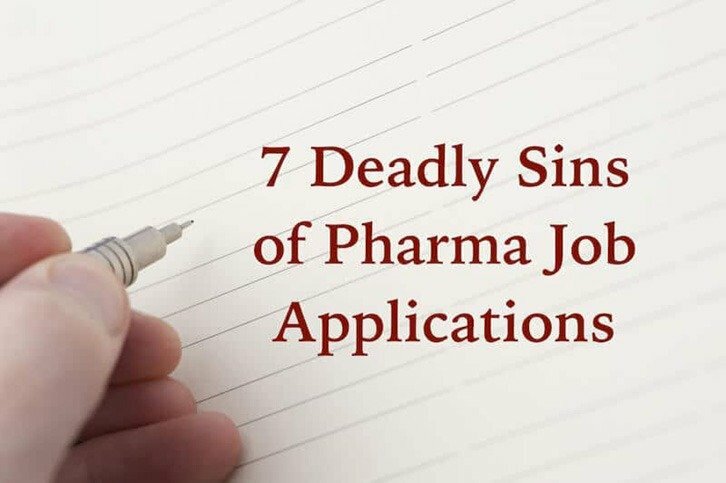 So those were our 7 deadly sins of pharmaceutical job applications – how many are you guilty of?! The key to being successful in this process is realizing that it can be completely demoralizing and not to take rejections personally. There will also be plenty of applications that you just never hear back about. And it can realistically take 125 applications to get a confirmed offer of a job, that’s just the environment we’re currently in and it’s true across all industries at the moment. Finding a job takes more hours than your average work week – if you go in with that expectation and can keep reminding yourself why you’re doing this, it all seems a little easier. And the main thing? It’s only temporary. Before too long you’ll be signing the contract for your first job in a new career and it will all be worth it. I’m Thinking of a Career in Pharma. What Should I Do Now? 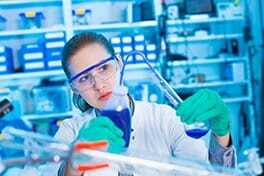 Check out this tool “Is a Pharma Career For Me?” to see how suitable you are for a career in pharma or medical device manufacturing based on your career and educational history. You might like to check out our post 5 reasons you should re-skill for a more comprehensive look at what the industry offers as a re-skilling option. Our eBioPharmaChem 30 Week Conversion Course will help you get a start in the industry and is FREE for Unemployed people in Ireland who qualify under the Springboard Scheme.